NetControl.net Archive of ::WELCOME TO FARM DIRECT MARKETPLACE !! "The Internet's first farmers market made up of real farmers." from the comfort of your home computer. "Just want to tell you I got my tomatoes today. They look GREAT !!! Thanks." This site uses the Crescendo Midi Plug-in and a variety of pages. If you do not have the Crescendo Plug-in installed you will likely get a Security Warning message as your browser attempts to start your local MIDI file player. This represents no danger to your system as MIDI files cannot carry viruses or other destructive codes. We do, however, recommend you obtain the Crescendo MIDI Plug-in which allows streaming MIDI to be sent to your browser. 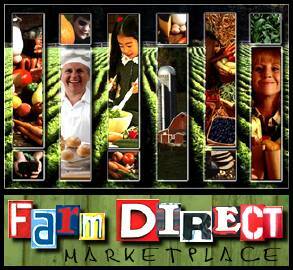 The Farm Direct Marketplace web site uses enhanced HTML encoding which is compatible with Netscape v1.1 and above. This encoding utilizes many features to improve the look and feel of our site, such as centering, text wrapping, spacing options, background colors and graphics, various font sizes, tables, and browser supported forms for submitting data, etc., etc... Non-Netscape compatible browsers such as ones from America Online, Prodigy, etc... DO NOT support these enhanced features. If you are not running at least version v2.02 of the Netscape Navigator browser, we HIGHLY recommend you upgrade to Netscape v3.01. CLICK HERE to learn more about upgrading to Netscape Navigator, including full instructions on how to use Netscape Navigator in conjunction with your America Online account. Click the Netscape icon below to go directly to the Netscape download site where you can download the newest version for FREE in about 15 minutes. Complete instructions will be provided. Still not running Netscape Navigator? Click to Download the latest Netscape Now! and find out what you've been missing!